Tastes like chicken. You have to love the old cliché that has been used to convince countless people to try frog, turtle or whatever is being served that might be considered unusual. It is hard to describe a food that is new to someone. That is why I tell people that lovage tastes like celery and ground cherries taste a bit like kiwi or pineapple. It gives you some idea of what to expect but neither tastes like anything I have ever had before. I have really enjoyed growing and using lovage to replace celery or cilantro in recipes. Beware, this plant may seem mild-mannered for a year or two but it really has big plans. By the third year my plant was a little over four feet tall. Lovage is a nice perennial background plant. The roots, leaves and seeds are edible but so far I have only used the leaves. I can’t really describe the taste but it tastes like um well um, tastes like lovage. Be brave. 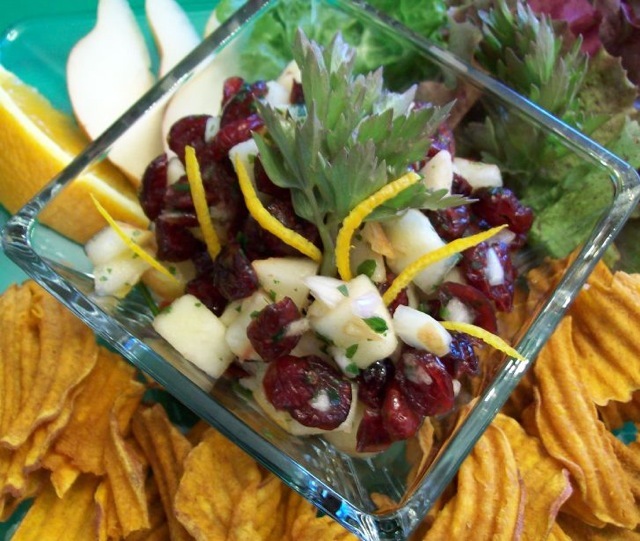 Give it a try in your garden then try my recipe for cran-lovage salsa with sweet potato chips. Toss together all ingredients except the pear. Let sit a few hours or overnight. Add pear and serve. Good as a salsa with sweet potato chips or as a relish with most any dish.